Sure, you could go down to the drugstore and grab a pair of reading glasses off the rack. And why not? Your eyesight isn’t that bad, and drugstore cheaters are definitely cheap. But what if that’s just not good enough? What if you’ve got high standards? What if you want a pair of reading glasses that not only look good, but are going to last, too? 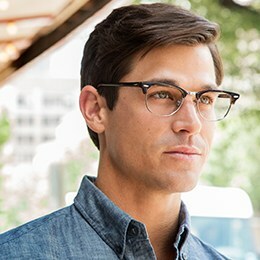 You might luck into a pair at CVS, but your much more likely to find the right look and the quality you want from a retailer like Framesdirect.com. We do one thing and we do it well: provide good-looking, high-quality glasses. Maybe you’ve noticed you have to hold your phone at arm’s length to read that incoming text. If that describes you, you’re not alone. A common vision problem many, many middle-aged adults experience is called presbyopia. Presbyopia, a normal change in the eye’s ability to focus, occurs when the lens in the eye loses elasticity—it just doesn’t change shape like it used to, and up-close objects you could once bring into focus now remain blurry. Of course, you should consult your eye doctor if you have any trouble with your vision. These days you can get all sorts of reading glasses. You are no longer limited to what’s on the drugstore carousel. If you frequent the beach, you’re in luck—you can find the right pair of stylish reading sunglasses. Popular designers like Costa and Maui Jim will not only complete your summer look, but keep you turning pages on the beach, too. Reading sunglasses are often available as bifocals, too, so you can wear them all vacation long. For those who stare at a computer all day or prefer to do their reading off a tablet, well, there’s something for you, too. Computer reading glasses will not only help you read small font sizes, but they are also designed to filter blue light from computer screens that lead to eye strain and computer-associated sleeplessness. If you want to take reading glasses to the next level, you can select from an array of high-end readers from name designers like Corinne McCormack and Polinelli Milano. Not only are the styles more attractive, they’re often available with favorite features like spring hinges. The nose guards, screws and other parts are going to be more durable and better quality, as well. You may pay a little more for designer readers, but, as the old saying goes, you get what you pay for. If you’re experiencing a change in your vision now you’ve hit middle-age—and that’s OK! (being middle-aged)—you needn’t settle for some cheap cheaters. You’ve made it this far—you deserve a pair of high-quality reading glasses that are going to not only look good for years to come, but are going last a long time.